If you are using a steel trailer, have it checked all over for rust, especially the floor. No matter what type of trailer, make sure the wires, lights and brakes work before taking it on the road and hauling horses. There is not much difference between a stock trailer and a horse trailer. 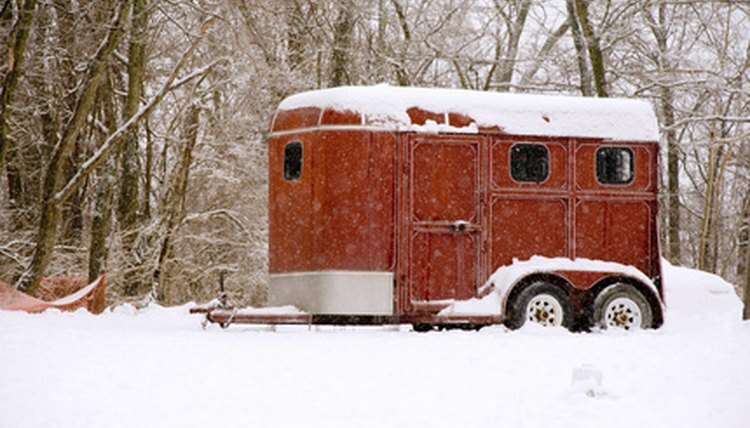 Horse trailers tend to be more safeguarded with mats, partitions, and padding. Stock trailers have bare-minimum accessories. Some people interchangeably use a stock trailer as a horse trailer. With a few mechanical items a stock trailer can be made into a pretty respectable horse trailer. The more valuable the horse, the more safety precautions you might want to take into consideration. Measure your trailer's length from the inside front wall to the back step off. Each horse will need approximately six feet on a slant load trailer. So if your trailer measures 18 feet, three horses will comfortably load slanted. Hang the bungies every 6 feet, starting at the front and ending in the back of the trailer. These bungies will be used to tie the horse into the trailer and keep them still for the ride. Some people use one, others like to use two. Bungies are safe because they can break. Chains will not break. Place mats down on the floor of the stock trailer. Stock trailers generally have metal floors making them easy to wash and clean out. Horses get nervous when they step in and hear the metal echo. The rubber mats will cushion that sound and the horse as they ride. Add the dividers if needed. Some horses can ride next to one another without a problem. If you are going to be shipping a lot of horses, including one that kicks horses that are not yours, partitions are highly recommended. Some stock trailers have the joints where you can insert the dividers. Other trailers you might have to get creative or take them into a trailer shop. Make sure that all the ventilation is open. Horses need air especially when traveling no matter what the weather. Rain will not come in too much when you are moving, and as long as there is more than one horse the horses will stay warm from their own body heat in cooler weather.